- prevention of gastric and duodenal ulcers associated with NSAID therapy, in patients at risk. • prevention of rebleeding following therapeutic endoscopy for acute bleeding gastric or duodenal ulcers. − gastroesophageal reflux disease (GERD) in patients with erosive reflux esophagitis and/or severe symptoms of reflux. Omeprazole interferes with gastric acid secretion by inhibiting the hydrogen potassium -adenosine triphosphatase (H + K + -ATPase) enzyme system, or proton pump, in gastric parietal cells. Normally, the proton pump uses energy from hydrolysis of adenosine triphosphate to drive hydrogen (H+) and chloride (Cl−) out of parietal cells and into the stomach lumen in exchange for potassium (K+), which leaves the stomach lumen and enters parietal cells. After this exchange, H+ and Cl− combine in the stomach to form hydrochloric acid (HCl), as shown below left. Omeprazole irreversibly blocks the exchange of intracellular H+ and extracellular K+, as shown below right. 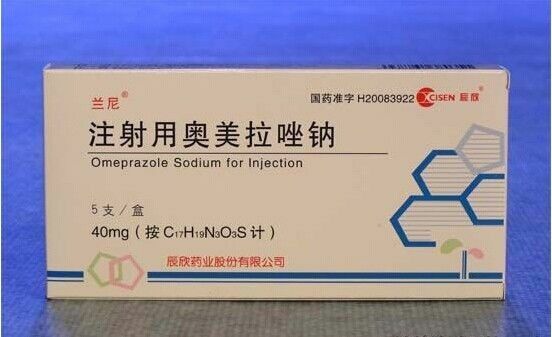 By preventing H+ from entering the stomach lumen, omeprazole keeps additional HCl from forming.